Matthew Barnaby didn't care for the view from the press box. That was probably the most disturbing aspect of the concussion that kept him out of the playoffs. Barnaby and the rest of the inactive Stars players had to sit and watch from afar, as their teammates hauled themselves out of a deep hole, only to fall to the Canucks in an excruciating Game 7 on Vancouver ice. "To not be able to help out was probably the hardest part, sitting there in the playoffs, not being able to control anything, sweating up in the box," Barnaby said. "I don't get nervous when I'm on the ice. You just play. But not being able to have an impact on the outcome was the hardest part for me." 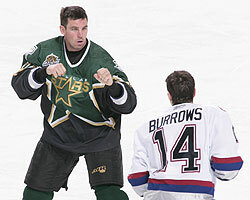 Barnaby, who turns 34 this month, was signed as a free agent last summer to provide the Stars with a gritty, physical presence, as well as serving as a veteran leader and taking on the opposing team's heavyweight, if fisticuffs were called for. For 39 games, Barnaby played an edgy game, collecting 127 penalty minutes, while also giving the Stars some skill with one goal and six assists. 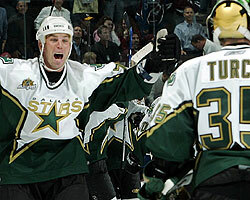 In addition, he reached two milestones in 2006-07, playing in his 800th NHL game and picking up his 300th point. But Barnaby sustained a concussion on Jan. 9 against the Phoenix Coyotes, and while he was hopeful his head would clear, he was forced to miss the season's final 38 games. Barnaby ached to get back on the ice for his eighth career trip to the playoffs and was cleared to practice, but team medical personnel could not give him the go-ahead for playoff game action. The 14-year NHL veteran wants to play another year, but only if he's re-signed by the Stars. Otherwise, he says he'll move on to the next phase of his life. The Ottawa native has played all over the country -- Buffalo, Pittsburgh, Tampa, New York and Colorado -- but right now, he feels Dallas is the right fit for him and his family. "I haven't made a clear-cut decision," Barnaby said. "I don't make decisions on a whim, especially an important one like this. There's one team I'd play for and that's here for the Stars. I'm not moving anywhere and I absolutely love the organization. I think they're as good as any I've ever worked with. They've treated me and my family with respect, so I'll sit down with my family and talk it over. I still feel I can play and be effective." If Barnaby does play another season, he won't be able to trade punches with brawlers who outweigh him by 30 pounds. "I don't think I can fight the heavyweights anymore," he said. "I don't think it's feasible at my size. The way I have to fight them is I have to turn my head sometimes and take shots, which is something I can't do. I can still play a physical game and hopefully add something but that's something for them to decide. I want to do what's best for myself and for the team." The Stars made Barnaby, his wife Christine, and their two children feel at home. His medical treatment was first class, and he offers deep praise to the front office, the coaching staff and his teammates. If the Stars want him back, this is where he'll play. "I told my wife I don't care if anyone else calls, it's not even a factor," he said. "I love my time here and love the people here, especially with what the organization has done for me through what was mostly a tough time. They made me and my family feel comfortable. I'm not going to let it linger, either. It's going to be quick...probably in the next month. "There's only one reason you play this game at my age, and that's to win a Stanley Cup. Anything else is disappointing. I love the team. The nucleus we have here is phenomenal. The coaches, the management, the people who work around the team...everything is first class."